Specialising in heated (and non-heated) towel rails, the Thermorail range has grown to be one of the most comprehensive available. All rails are easy to clean and maintain with most rails supplied in polished stainless steel and some models have white, gold or brushed finish. 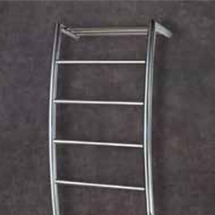 Thermorail stainless steel heated towel rails are dry element operated for rapid heating and long element life. This increases towel rail efficiency, consuming less energy to maintain the same temperature under towels. Thermorail products are all backed by a satisfaction guarantee.